On July 5th, 2015 a futsal tournament “Kubok AVTO–2015” was held where our team took a second place in a silver play-off. 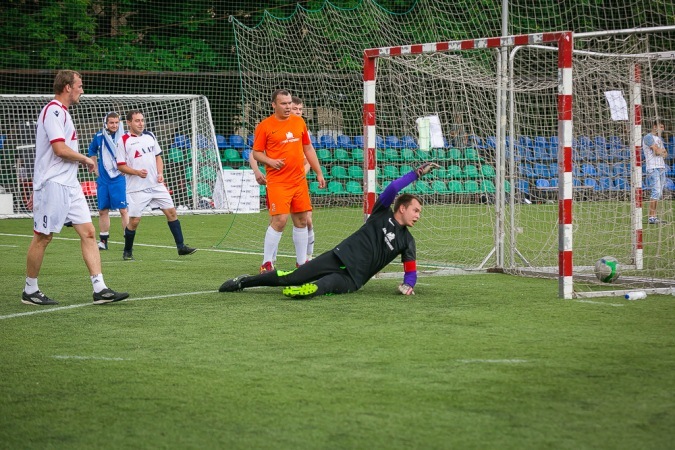 12 teams from Moscow, Nizhny Novgorod, Ryazan region, Vladimir and Tula participated in the tournament. That day we were happy in sunny weather which had a favorable effect on team mood. All teams were divided into three groups and fought for a place in a golden and silver play-off. After quarterfinal matches in the silver play-off four teams (taxi KOMANDIR, Geely, Dveri Regionov and NAMI) dropped out of the tournament. In the semifinal Porta Prima played with SAAZ Complekt and Alpha Automotive Technologies with Grand Techcenter. Porta Prima got a confident victory by a score of 4:1 and could reach the final together with our team which won by a score of 1:0. SAAZ and Grand Techcenter fought for the third place in the tournament. The final match between our team and Porta Prima was very tough and ended in a draw. Only penalty kicks could decide the match and find the winner of the silver play-off. It was Porta Prima and our team took the second place. Impossible not to mention our supporter team which got the first place once again! We had to do an acrobatic feat to win a sacred cup! Thanks to everyone who supported our guys in the tournament! Everybody on Community Cleanup Day! Make Moscow cleaner! Mini-soccer tournament “Cup Car Business 2016”.